Some states, localities, and large restaurant chains were already doing their own forms of menu labeling, but this information was not consistent across the areas where it was implemented. Calorie information will now be required on menus and menu boards in chain restaurants (and other places selling restaurant-type food) and on certain vending machines. This new calorie labeling will be consistent nationwide and will provide easy-to-understand nutrition information in a direct and accessible manner. Calorie labeling is required for restaurants and similar retail food establishments that are part of a chain of 20 or more locations. For standard menu items, calories will be listed clearly and prominently on menus and menu boards, next to the name or price of the food or beverage. For self-service foods, such as served from buffets and salad bars, calories will be shown on signs that are near the foods. Calories are not required to be listed for condiments, daily specials, custom orders, or temporary/seasonal menu items. Calorie labeling is required for vending machine operators who own or operate 20 or more vending machines. Calories will be shown on a sign (such as on a small placard, sticker, or poster) or on electronic or digital displays near the food item or selection button on vending machines and “bulk” vending machines (for example, gumball machines and mixed nut machines), unless calories are already visible on the actual food packages before purchase. In addition to calorie information, restaurants are also required to provide written nutrition information on their menu items, including total fat, calories from fat, saturated fat, trans fat, cholesterol, sodium, total carbohydrates, dietary fiber, sugars, and protein. You may see this information on posters, tray liners, signs, counter cards, handouts, booklets, computers, or kiosks. So, when eating out, don’t hesitate to ask for nutrition information! 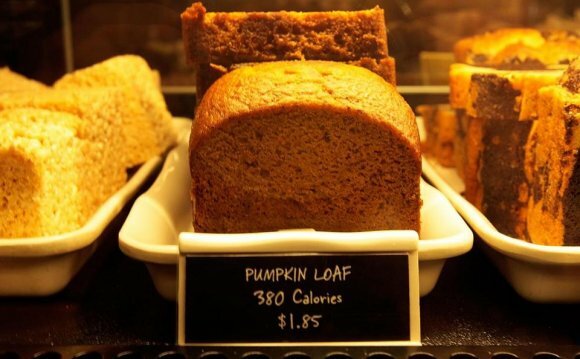 Calorie Information: Check the Menu! Alcoholic drinks, such as cocktails, when they are listed on menus. If there are two choices available (for example, vanilla and chocolate ice cream), both calorie amounts will be listed and separated by a slash (such as 150/300 calories). If there are more than two choices (for example, vanilla, chocolate, and strawberry ice cream), the different calorie amounts will be presented in a range (such as 150-300 calories).